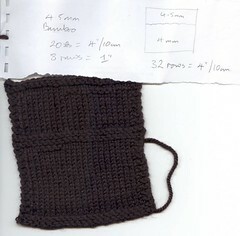 I’m trying to work soley on “Acorn”, but knitting stocking stitch on 3 mm needles from here to eternity isn’t easy! Ermm … I mean … it’s good for my hands to change needle size and type of yarn. Yeah, that’s it! 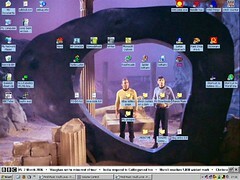 Yes, that is a screen shot from Star Trek. Spock was my hero! 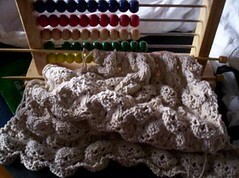 I’ve finally picked up shrug again and managed a couple of rows. In the background you can see my abacus low-energy environmentally-friendly portable calculating device. I have, and use, 4 different types of calculators depending on the task in hand. 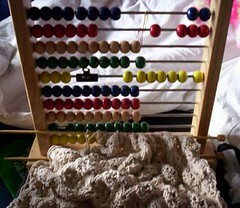 Of course I own an abacus! 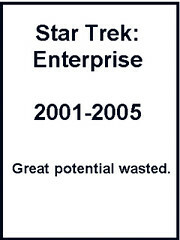 Sorry, but I really disliked most of the the whole Enterprise serie. I love watching Star Trek and I guess the first serie of Enterprise was ok, but they lost me somewhere in serie 3. I think they have just began airing serie 4 here, but they show it onn saturdays midday and I never manage to watch tv then anyway. I must have blocked out the ending, I can’t really remember it. I was pretty teed when they killed off Trip though, that guy is hot =) I thought the series left a bunch of questions unanswered. On the whole, though, I like any Trek series so I am totally easy on them. I think Enterpise would have been better if they could have gone one more year, instead of having to wrap things up in a few final episodes. OH WELL.